Seriously I could eat curries the whole year. It’s definitely not a season thing for me. Think of spring, summer, autumn and winter. Yes I could eat them almost every day. 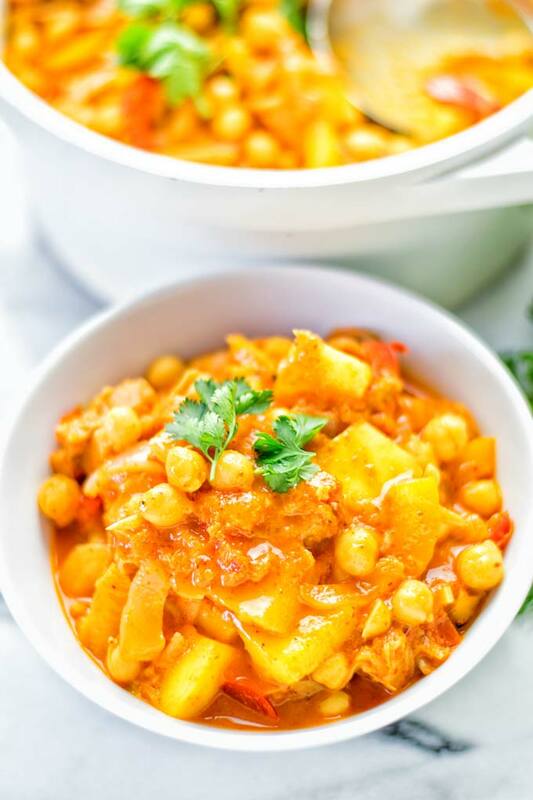 While I love munching on a big bowl of my Lentil Chickpea Yellow Curry, there is always room for something new. 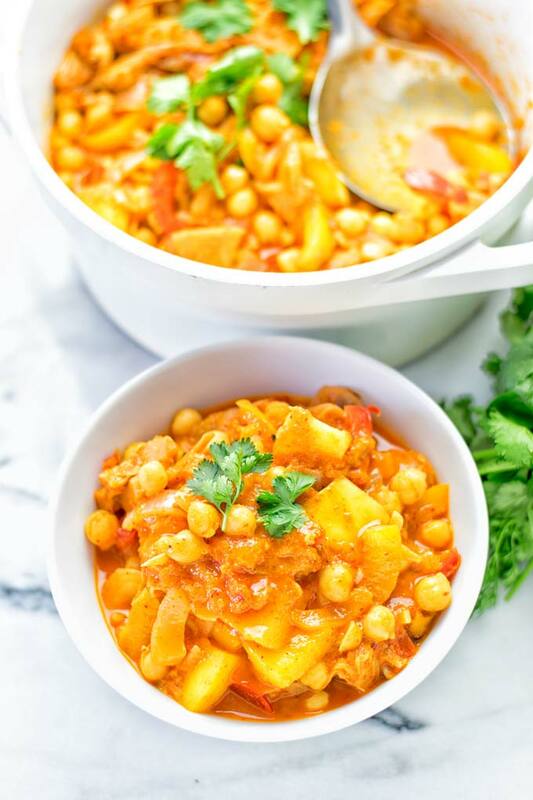 This Spicy Mango Jackfruit Curry is a flavor sensation, packed with incredible flavors, an amazing one pot meal, super creamy thanks to coconut milk, perfectly seasoned in and out. It’s fresh, addictive, modern and every time delicious by adding some optional extras to your own taste. If you aren’t familiar with jackfruit, give them a try. 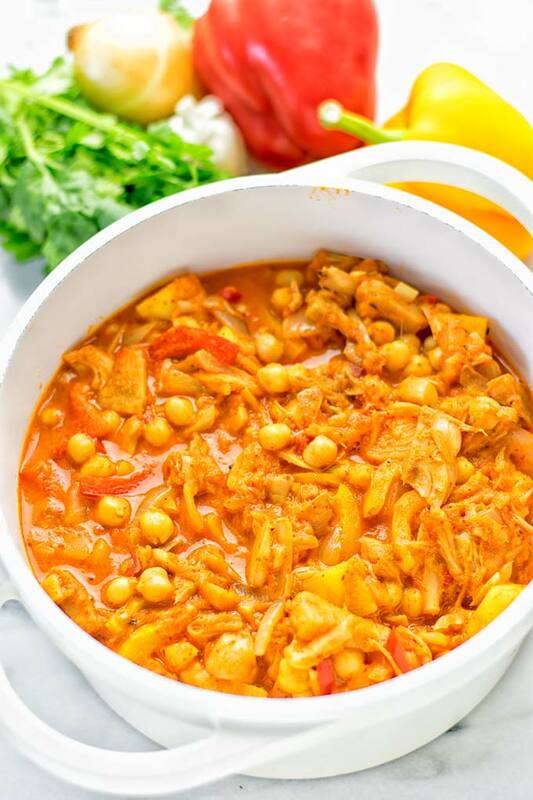 Jackfruit is amazing for so many different dishes. Cut the jackfruit into small cubes. Heat a bit oil (or vegetable broth for oil free cooking) in a pot. Start by adding garlic, the optional onions and bell peppers. Fry them at medium heat for about 4 minutes. Next add the jackfruit cubes, coconut milk, curry paste, and optional chickpeas. Cook for 5 minutes longer. Finally, let’s finish with giving the mango to the pot. Let cook for another 2 minutes. Check the texture of the vegetables. They should be tender and done. Serve in bowls or on plates over rice or quinoa. That’s how to make jackfruit curry. 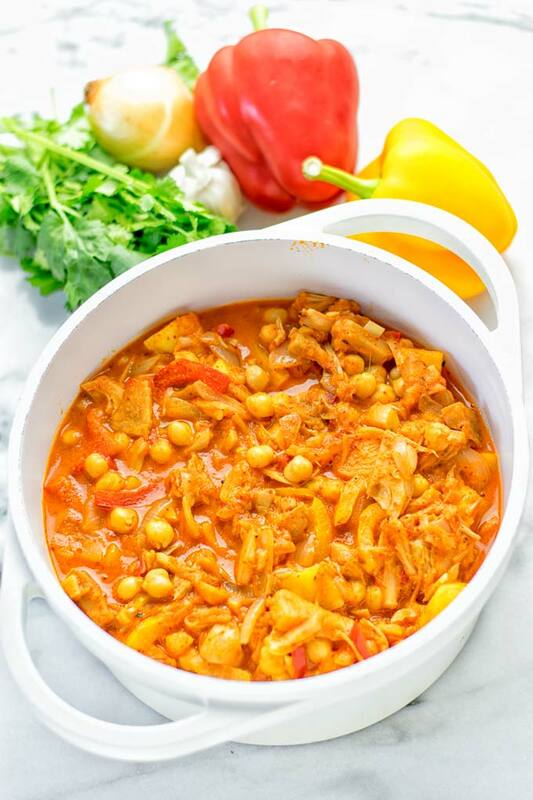 This makes an amazing dinner or lunch, and is great for meal prep. 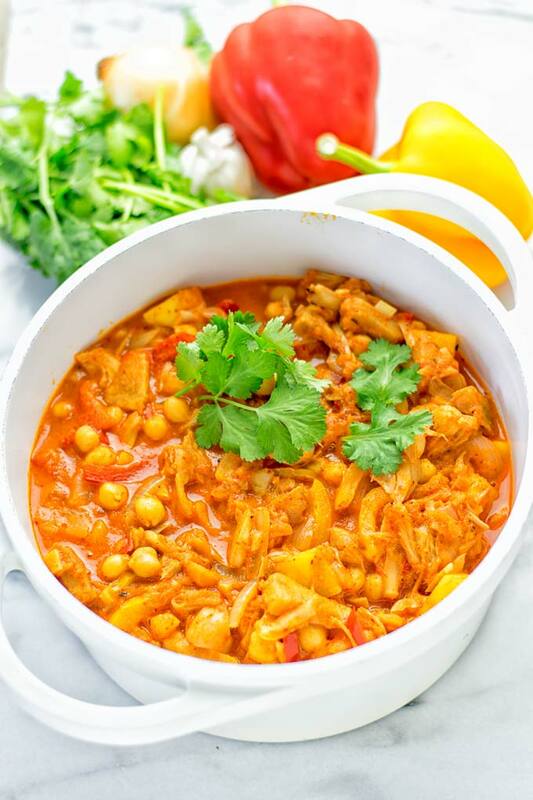 Even for work lunch this Spicy Mango Jackfruit Curry makes things so much easier. Yes, no need to go the food courts with expensive and not filling options for you make it yourself. 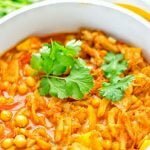 If you need more great work lunches and meal prep options look no further than my 10 Best Easy Vegan Work Lunch Recipes. You can find them at almost grocery, Asian, or organic stores. Of course you can always try to find them online. 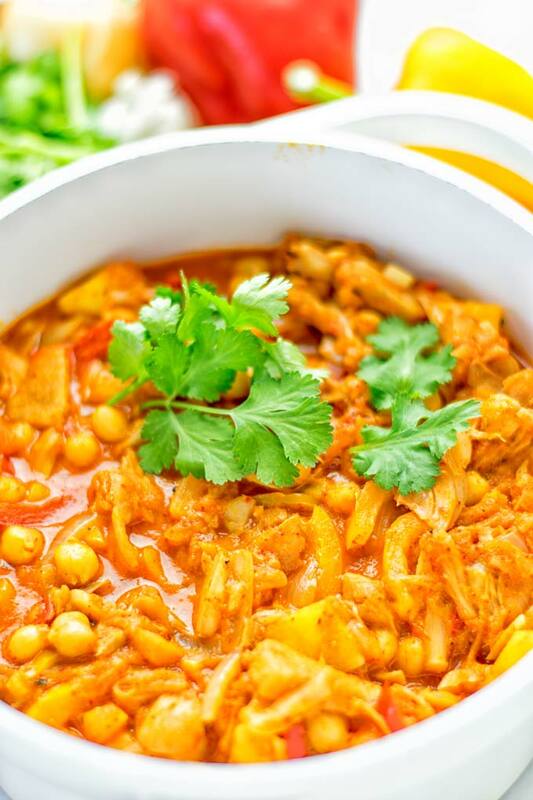 It can be fresh, or you can used canned jackfruit in water or brine. It’s up to you what you prefer and what kind you get the most easy access to. One tip to using canned jackfruit in brine: please make to wash the brine from the jackfruit properly. Do not only drain them. This can be a bit tough and tricky. Some grocery stores carry them, or you can get them at a farmer markets. If you truly feel the need for fresh jackfruit, I’m with you. It’s so good. Try asking a grocery store employee or manager and let them order some for you. Most stores do that for their customers, so it’s worth a try. 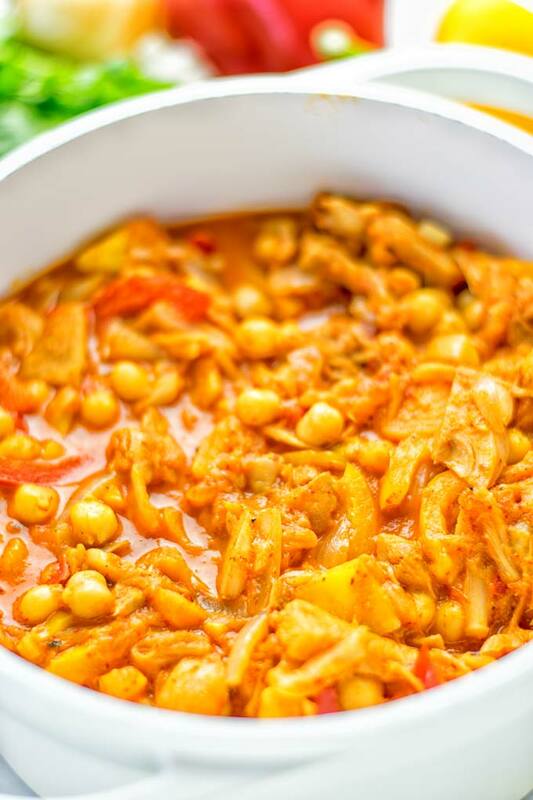 You can see I decided to try yellow curry paste in this Spicy Mango Jackfruit Curry. I got mine at a local store so it was really easy to get. All you need for this is lemon juice + zest, garlic, onion, chili, turmeric, chili powder, and a pinch of salt and pepper to taste. Also you will need a bit water to thin which will depend on the desired consistency. This is a really basic method for making yellow curry paste, I don’t use any quantities because when it comes to flavors we are all different. If you like it a bit spicy, add more chilis. If you need a bolder color add more turmeric. But be careful with the turmeric. I would suggest to start with 1/2 teaspoon and go from there and increase to 2 tsp. 2 tsp is definitely enough. No need for increasing the amount more. Otherwise it will be to dominant and won’t work for the taste. Back to the curry paste. Simply put all the ingredients in a food processor and process to a paste, done. If you have a too sticky and thick paste, simply add a bit of water. I would suggest start with 1/4 cup or less. Finally, I also tried this Spicy Mango Jackfruit Curry with red and green curry paste. Both are delicious and work really well. You can expect a bit different color, if you do this, but it was delicious. Honestly I find out the real wow flavor factor I got truly with yellow curry paste. So if you get it, choose always this paste for the most delicious experience. 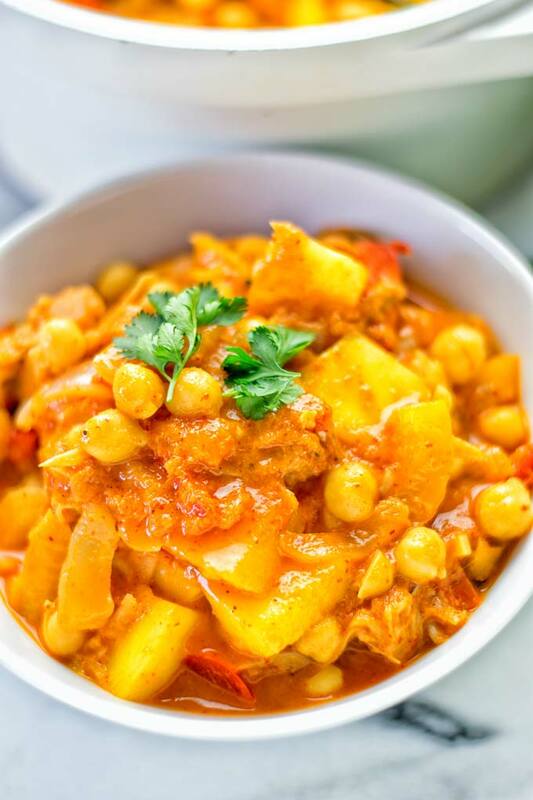 Try this Spicy Mango Jackfruit Curry for yourself and wow everyone. Show off your results on Instagram and Facebook with a tag and snapped picture so I can see all your fantastic remakes. Cut the jackfruit into small cubes. Heat a bit oil (or vegetable broth for oil free cooking) in a pot. Start by adding garlic, the optional onions and bell peppers. Fry them at medium heat for about 4 minutes. Finally, let’s finish with giving the mango to the pot. Let cook for another 2 minutes. Check the texture of the vegetables. They should be tender and done. Serve in bowls or on plates over rice or quinoa.